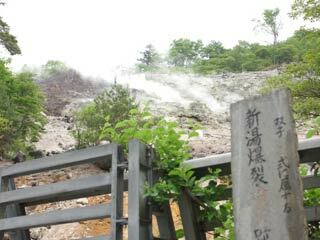 Okushiobara New Volcanic Spring (奥塩原新湯爆裂火口跡) is active volcanic spring located Okushiobara, Tochigi Prefecture. You can see the gas and hot water springs from the ground, and it just look like an under world. There is parking, restroom and public Onsen. 1. use bus to Shiobara Onsen. 2. use local bus to Okushiobara. There is Onsen Shrine which built in 1175.